A gift to you from FOX Sports Midwest. 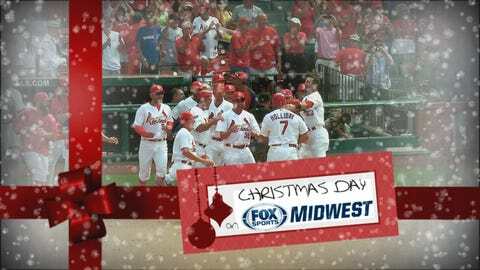 ST. LOUIS — FOX Sports Midwest will replay five of the most memorable games from the NL champion St. Louis Cardinals’ 2013 regular season on Christmas Day. The third annual Cardinals Christmas marathon starts Wednesday, Dec. 25, at 12 p.m. CT. Each game is edited into a two-hour window. Allen Craig and the Cards slam the door on Cincinnati. Shelby Miller is almost perfect. The Cards walk off against the Pirates. Matt Adams homers twice in extras.